Custom Printed Juggling Balls, Juggle, Promotional, Customized, Imprinted, Advertising. 3 Juggle Balls in clear drawstring carrying pouch. Imprint Area: 1-1/2" in diameter. Under minimum order, add $35.00. Prices, colors, sizes and quantities subject to change without notice. Black, White, Silver, Orange 1665, Brown 649, Gold, Yellow 107, Dark Green 343, Green 347, Teal 320, Baby Blue 292, Navy Blue 281, Royal Blue 2728, Purple Violet C, Pink 211, Burgundy 209, Red 186. CUSTOM ARTWORK/LOGO/: Please provide ready artwork in vector format 300+ dpi and email it to us in (.eps, .ai, .pdf) files. To Email your artwork to us, click here. PROOFS: If requested, add $12.00 for email/fax proof of your logo, text, or both. Any author's alterations made after the proof has been sent to you, click here for artwork modification/ preparation. NOTE: If the artwork you submit to us needs to be redrawn, fixed, or typesetting, please click here for artwork charges. Set-up Charge: $57.00 per design/ per color. Random samples: $9.50 per set. Min. order for unimprinted Juggle Balls: 250 Sets Shipping charges will be additional. 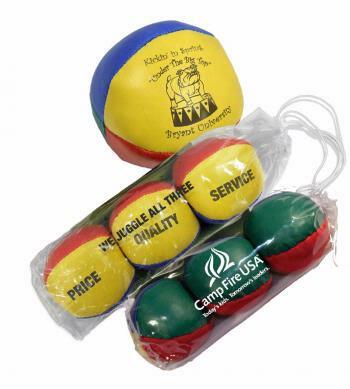 • Juggle balls liven up any promotion or event. • Ideal specialties for company picnics, schools, family reunions, juggling teams and youth-oriented institutions. Watch your ad message soar! Sport Gold, Red, Green & Blue panels. Unless otherwise instructed, Juggling Balls will be imprinted on yellow panel. Dark ink recommended. White ink not recommended on yellow panel. Black, White, Red, Royal Blue, Navy, Blue, Baby Blue, Green, orange, Yellow, purple, Brown, Maroon, Gold, Silver. Add $1.05 per set of 3-juggling balls, one color, one position. $40.00 per color. Exact color match can not be guaranteed. Juggle balls are bagged 3 per set with instruction sheet. 50Lbs./100 sets(242019). From receipt of complete order and approved artwork, allow approximately 8-12 working days production time. To place your order, click here. Then follow the instructions in the ordering form, or call us at the telephone number shown at the end of each page and place your order. Remember. Customer satisfaction and high quality service to our customers is our main goal. Back to Promotional Products page, click here. To Email your artwork, purchasing orders, or inquires, click here.